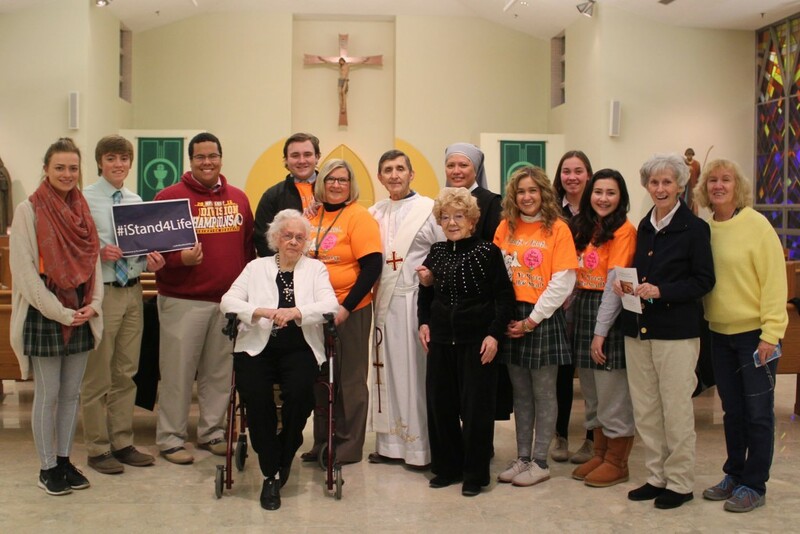 The Little Sisters of the Poor and Holy Cross High School sponsored a local “March for Life” and prayer service on Friday, Jan. 22, 2016 – the 43rd anniversary of the United States Supreme Court’s decision to legalize abortion. The walk, which included a group of nearly 50 people composed of Little Sisters; Holy Cross High School students, faculty and staff; clergy and members of the community, began at Holy Cross High School, Dunmore, and stretched nearly 2 miles to Holy Family Residence, Scranton. Upon their arrival at Holy Family Residence, the marchers were greeted by more Little Sisters and the elderly residents entrusted to their care where they completed the march together. Following the march, the group gathered for a prayer service in the residence’s chapel to pray for the protection of life and the more than 57 million lives lost to abortion since its legalization in 1973. Pictured are some of the participants of the local “March for Life” and Prayer Service sponsored by the Little Sisters of the Poor and Holy Cross High School on Friday, Jan. 22 – the 43rd anniversary of the United States Supreme Court’s decision to legalize abortion. Standing from left to right: Jackie Dende; Tom Dzwonczyk; Gannon Palmiter; J.J. Backus; Kathy Yaklic; Deacon Ray Pieretti; Mother Theresa Louisa, l.s.p. ; Audrey Roche; Christina Brannon; Meghan Healey; Elizabeth Arbie; Dorothy Densevich, and Judy Messoline.